The DS Podium Valgranges Automatic is back, wearing an elegant anthracite dial with distinctive brio and class. In an identical oversized, masculine case as the previous edition, this latest model is equipped with the same cutting-edge Valgranges movement, to unite the finest technology with sharp sport-classical design. 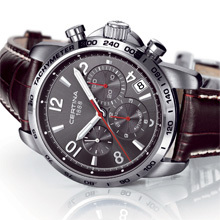 In longstanding CERTINA tradition, this timepiece is a bold confirmation of a man's uncompromising good taste. 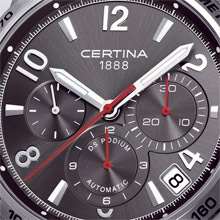 CERTINA's masterly watchmaking vocabulary flows around these three significant words: Style, Reliability and Precision. The Swiss watchmaker's latest chronograph, the DS Podium Valgranges, is a pure expression of these fundamental principles. It proudly innovates, with a classical design enhanced by an elegant anthracite grey dial with sunray finish. Equipped with a monumental 44 mm-diameter case and an ETA Valgranges automatic chrono movement specially created for large watches, it brings together excellent ruggedness, gorgeous style and faultless precision. The new DS Podium Valgranges is a handsome composition of harmonious textures and finishes. Its brushed-surface steel case sports a contrasting polished steel bezel with tachymeter markings. Behind a sapphire crystal with anti-reflection coating on both faces, the new anthracite dial is equipped with three snailed counters for 12 h and 30 min (chrono), and small seconds. A large central second hand completes chronograph timing functions, easily identified by the presence of bright red-coloured hands. Superluminova has been added to the main HM hands for best legibility under low lighting conditions. The new timepiece is water resistant up to a pressure of 10 bar (100 m), and boasts a protected crown whose tip is monogrammed with the letters 'DS'. The DS Podium Valgranges Automatic has a transparent case back, to reveal the finesse and artistry of its superb Valgranges movement, an industry standard for quality and precision, a feature which is sure to be appreciated by all lovers of exceptional watches. It comes equipped with a brown leather strap joined by a butterfly clasp with two push-buttons.